Nikolao Glaros came from Icaria, Greece. We found a New York, Passenger Lists, 1820-1957 that shows a Nikolao Glaros arriving at the New York Harbor on September 28, 1906. The ship's manifest information mostly fits our Nikolao Glaros. According to the Passenger List, the Nikolao Glaros, passenger, was 11 years and 11 months when he arrived. If this is our Nikolao Glaros, it means he was possibly born in October of 1894 and came to the United States at almost the age of 12. Icarians began to settle in America in the 1890's. In the Western States, they labored on railroad construction and in mines. As early as 1907, it was estimated by the Greek Consul General in New York that there were between 30,000 and 40,000 Greek laborers in the American West. Greek railroad laborers were especially concentrated in California, where in 1910, there were more Greeks proportionate to the total state population than anywhere else in the U.S. Many of the Icarian immigrants expected to work and return to their homeland after earning capital and dowries for their families. Perhaps that was Nikolaos's plan. According to his death certificate, he was born to Staros Glaros and Maria Zachros. He lived in California for nine years and possibly spent time in Willits, CA with a James Glaros (informant on death certificate). He was 21 years old at the time of his death. According to newspaper articles, we know that Nikolao was a track laborer for the railroad. His job was to make sure the rail lines were inspected, repaired and maintained. It was a physically demanding job that took Nikolao wherever the railway took him. For whatever reason, Nikolao slept on straw near the Moraga railway station on the night of July 9, 1915. He began to show symptoms of illness on July 13th and was taken to the county hospital for examination. A bubo was found on his right femoral region and was examined by placing some of the fluid into two guinea pigs. The guinea pigs died in five days. Upon post-mortem examination of the pigs, it was confirmed that Nikolao had been bitten by an infected squirrel and died from Bubonic Plague. Nikolaos died on July 21, 1915 at 8PM, in the Martinez County Hospital. 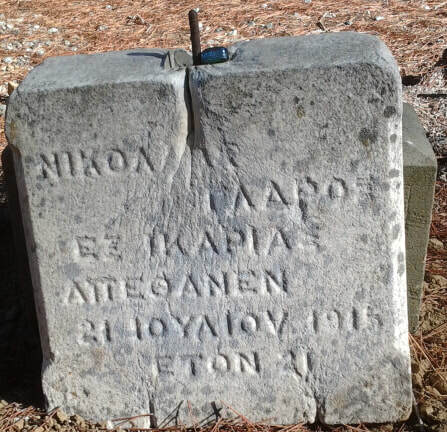 Nikolaos was buried on the same day that he died in Potter's Field, Alhambra Cemetery, Martinez. His case was the only one in the state since October of 1913 when another case appeared in the same county at Walnut Creek. Nikolao's case was investigated in the field and in the laboratory by the United States Public Health Service. An investigation was also conducted with his culture by the State Hygienic Laboratory. Nikolaos's death created an extended campaign against the plague which was conducted in Contra Costa County by the State and County Boards of Health. His case reached many medical research reports, bulletins and records in the United States, including Texas Medicine. He was also in the Tulsa Daily World newspaper on Friday, August 12, 1915. Nikolaos's headstone was repaired and reinstalled on Monday, September 18, 2017 by the Napa Monument Co. and funded by Dorothy Glaros and the Pan Ikarian Brotherhood Association. The rusty nail was removed and cracks were repaired, along with a well deserved cleaning. The opposite side is new stone with the original Greek lettering newly etched into the stone. The headstone has been secured into the base with new stainless steel rods.